Four years ago, I was on a press trip in Miami with a bunch of other beauty editors. I was sitting by the hotel pool in a backless one-piece swimsuit when I suddenly felt an itchy, tingly sensation on my back. I craned my neck to get a look and noticed an egg-sized rash made up of tiny pink bumps on the right side of my torso. I thought maybe it was a sunburn or cluster of mosquito bites, but I had been pretty diligent about applying SPF and no one else in my group was complaining about bugs. When I got home the next day, the rash was still there — and it still hurt. It almost felt like little electric jabs in my side. I booked an emergency appointment with my dermatologist because I had a vacation planned later that week and wanted to get this taken care of before I left town again. Almost as soon as my doctor saw my rash, she told me I had shingles. Needless to say, I was shocked. 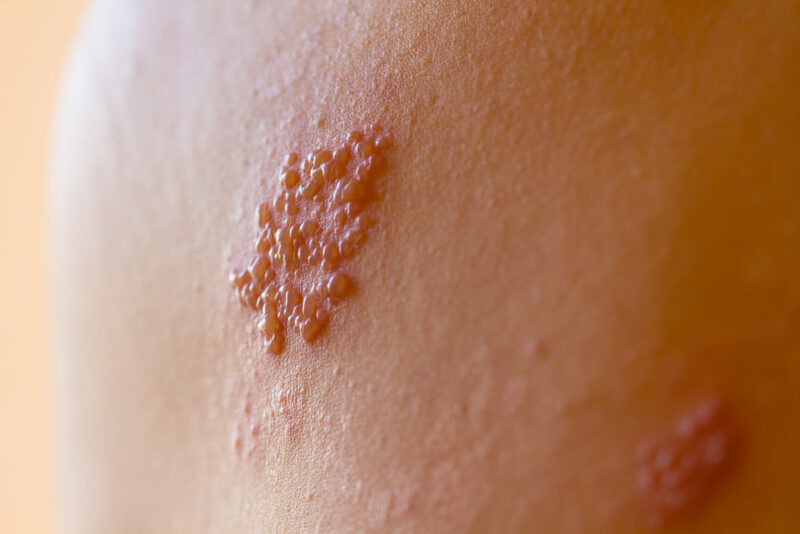 Diagnosed with shingles… now what? I had seen lots of shingles commercials on TV and they always featured elderly people — how could a relatively healthy 25-year-old like me have gotten this disease?! 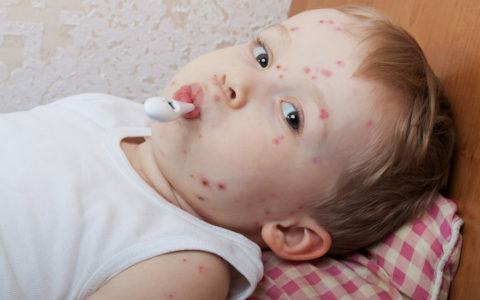 My dermatologist explained that anyone who’s had chicken pox could get shingles since the same virus (varicella-zoster) causes both of them. She also explained that the virus actually lies dormant in your nervous system and can be reactivated in the form of shingles if your immune system is weakened. Yikes. So why had I seen so many commercials featuring people who were my grandparent’s age? Turns out older people are more susceptible because their immune systems aren’t as strong. Although my doctor couldn’t say for sure what brought on my shingles, she did say that stress (which I had loads of at the time) could have weakened my immune system and put me at risk for a shingles outbreak. Great. I was given an oral prescription, Valtrex, to speed up healing time and ensure that the rash didn’t spread. I was actually really lucky that I went to the doctor pretty early on because the medication is most effective in the first 48-72 hours. My dermatologist told me I should head straight home and not go back to my office because shingles is contagious until the rash crusts over. While I couldn’t give someone else shingles, I could infect someone with chickenpox if they’d never had it. She also suggested I cancel my upcoming vacation and focus on resting — because, in addition to the painful rash, I felt exhausted. Womp, womp. I spent the next week at home in my PJs bingeing on Pretty Little Liars and The Vampire Diaries. My shingles rash was sore and tender to the touch for the next few days, and unfortunately, my dermatologist said there wasn’t much I could do for the pain. She suggested adding white vinegar to a warm bath for relief, which I did once a day, but honestly, it didn’t really help all that much. I also bought an arnica cream, which provided a little cooling relief. My rash was conveniently right where the band of my bra sat, which meant wearing a bra added to the pain. In other words, I lived in loose T-shirts while I recovered. After about three days, my shingles finally started crusting over and the pain began to subside. I went back to work a week later (by that point, I was going stir-crazy!) but it was still another couple of weeks until my rash completely faded. In the months after my shingles disappeared, I would occasionally still feel a stabbing sensation right where my rash was. Sounds scary (it kind of was) but it’s actually a known side effect and complication of shingles that’s called postherpetic neuralgia (PHN). To this day, I sometimes notice pain in the spot where I had shingles, but it usually subsides within a few seconds. That being said, I was really lucky that I went to the doctor when I did because my shingles rash could’ve easily spread across my body, forming a band around my torso. In the grand scheme of things, my case was pretty mild. But it turns out it’s possible to get shingles for a second or even third time. (There is a shingles vaccine, but it’s typically only recommended for those 60 and older.) So, although I don’t know for sure what caused my shingles, I have taken steps, like incorporating yoga into my routine, to nix stress just in case that played a role. My good friend got shingles at 24; her job had become incredibly stressful to the point of making her sick in a variety of ways. Suddenly one day she started complaining about a bad pain in her side and it finally got to the point where she went to the doctor (By that point the shingles had formed a band around her torso.) Anyway, she ended up being out of work for a few weeks (which only stressed her out more!) and I’ve been terrified of getting the shingles ever since. The one difference from your situation that stands out is the fact that her doctor prescribed Vicodin which helped the pain immensely but ultimately led her to being addicted to opiates. She spent the next 7-8 years truly addicted, and the last time we spoke, she was into “heavier” (aka stronger) things like Morphine, oc, and Dilauded. Scary stuff. I hope your future is bright and 100% free of sharp, random shingles pain. Thanks for writing about this issue, I think most young people don’t know much about shingles and I hope you’ve opened people’s eyes.